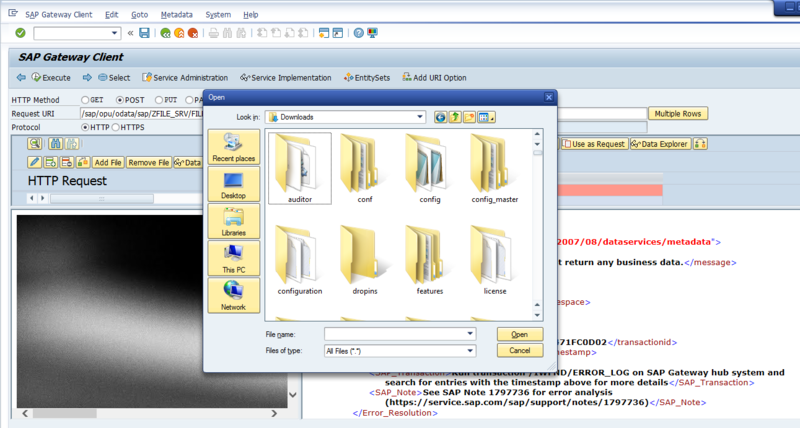 We will be creating OData for creating and reading Media files and consume it in SAPUI5 application. 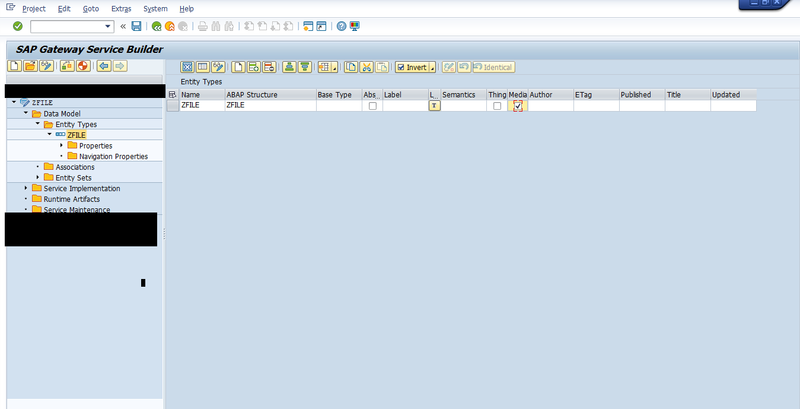 A trial account on SAP Cloud Platform with Web IDE Service enabled. Hana Cloud Connector should be in active state. Component IW_FND and IW_BEP both have to be at least on SAP Net Weaver Gateway 2.0 SP09 or component SAP_GWFND is on SAP Net Weaver 7.40 SP08. Currently, URLs containing segment parameters such as; mo ;o, or ;v=.. Cannot be processed in the soft-state processing mode. Register the Odata Service and test it from Gateway. Consume the Odata Service in UI5 Application. Create Table in SE11. (You may put any name as you like, i have used name ZFILE for the Table). Goto SEGW, Create OData project, import your table (ZFILE) from DDIC structure to create ENTITY_TYPE. Select the entity type “ZFILE” you just created and Choose the check box media as selected. Now generate Runtime Artifacts and Redefine the DEFINE method of the model provider extension call. lo_entity = model->get_entity_type( iv_entity_name = 'ZFILE' ). lo_property = lo_entity->get_property( iv_property_name = 'Filename'). Click on the Methods tab and redefine the method /IWBEP/IF_MGW_APPL_SRV_RUNTIME~CREATE_STREAM . read table it_key_tab assigning <fs_key> index 1.
insert into zfile values lw_file. Now click on the Methods tab and redefine the method /IWBEP/IF_MGW_APPL_SRV_RUNTIME~GET_STREAM . read table it_key_tab assigning <fs_key> index 2.
select single * from zfile into ls_upld where filename = lv_filename. if ls_upld is not initial. copy_data_to_ref( exporting is_data = ls_stream   changing  cr_data = er_stream ). Now click on the Methods tab and redefine the method /IWBEP/IF_MGW_APPL_SRV_RUNTIME~UPDATE_STREAM. Now click on the Methods tab and redefine the method FILESET_GET_ENTITYSET. p_name     TYPE c LENGTH 15. Register the Odata service to the Gateway server. 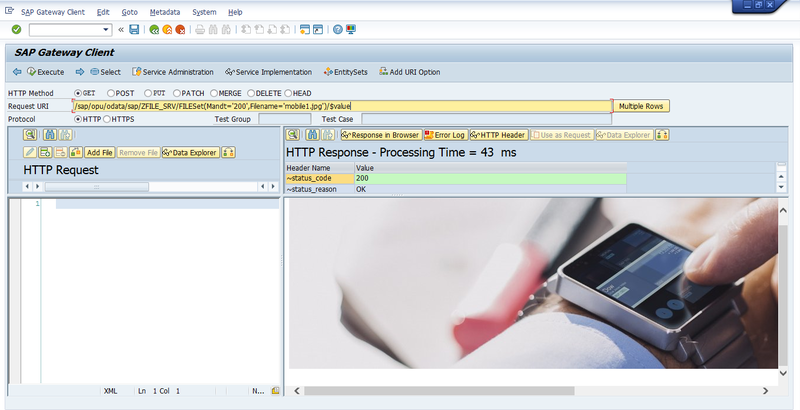 Open the Odata service with SAP Gateway Client. Check get stream method with following URL (Will be used for downloading purpose) . Check create stream method with following URL (Will be used for uploading purpose). Select the Post Radio button and select the FILESet Entity Set. Select “Add File” button and choose the File to be uploaded.Click on “Add Header” button and enter the value of header.Enter value SLUG in Header Name.Enter name of the file in Header Value. NOTE : Response of the URL may contain following error, but this should not cause any problem. The file is uploaded successfully. 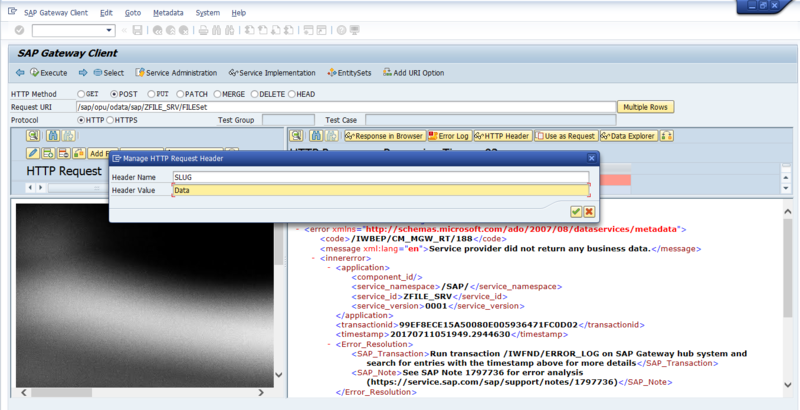 STEP 3: Consume the Odata Service in UI5 Application. Open the view1.view.xml file and put below code there. Open the view.controller.js file and put below code there. Nice one Himanshu. Thanks for sharing. I am getting 405 method not allowed error. Please check this link related to above error. If u still not able to resolve the problem then please describe the error in detail. It is a very helpful post but I am getting the below error Could you please help me on the same. 1. [ODataMetadata] initial loading of metadata failed . 2.Failed to load http://uk1gcnsd31701.corpnet2.com:8080/sap/opu/odata/sap/ZSD_ORDER_FIORI_SRV/$metadata : Response to preflight request doesn’t passaccess control check: No ‘Access-Control-Allow-Origin’ header is present on the requested resource. Origin ‘http://localhost:63525’ is therefore not allowed access. The response had HTTP status code 401.